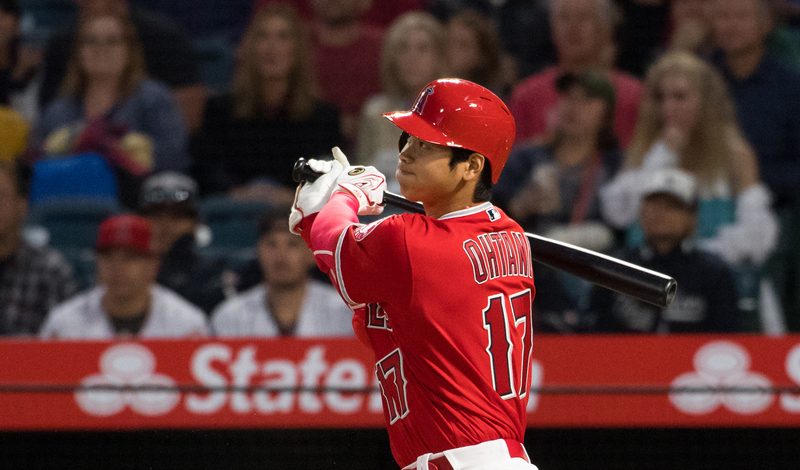 SHOHEI OHTANI hit two home runs and had four hits total in the Angels’ 9-3 win over the Texas Rangers on Wednesday (Angels photo). He may not be able to pitch for a while, but he still can certainly hit. Shohei Ohtani, soon to be sidelined from pitching because of an injury and likely Tommy John surgery – to the elbow on his pitching arm, hit two home runs Wednesday as the Los Angeles Angels of Anaheim (68-72) defeated the Texas Rangers (61-79) 9-3 in Arlington. Ohtani, diagnosed this week with damage to the ulnar collateral ligament is his right elbow, nevertheless is swinging a mighty bat. In the fifth inning he hit his 17th home run of the season, a two-run blast. Then in the eighth he lifted a solo homer, his 18th. The 24-year two-way phenom will apparently stay in the Angel batting order. “He trusted that we’d use him in a two-way role, and we made that commitment,” Angels general manager Billy Eppler said. Ohtani ended up with four hits in four at-bats as well as a walk. He scored three times and drove in three runs. The Angels as a team batted well against former Halo star Bartolo Colon and his successors. They collected 16 hits and three homers, the other hit by Andrelton Simmons. Four Angels – David Fletcher, Simmons, Jose Fernandez and Taylor Ward – each had two hits. Kole Calhoun had just one, but turned in a stellar play in right field for the third out with the bases loaded in the early going. The win went to Jaime Barria (10-8), who worked five two-hit innings. He struck out five batters and walked three.